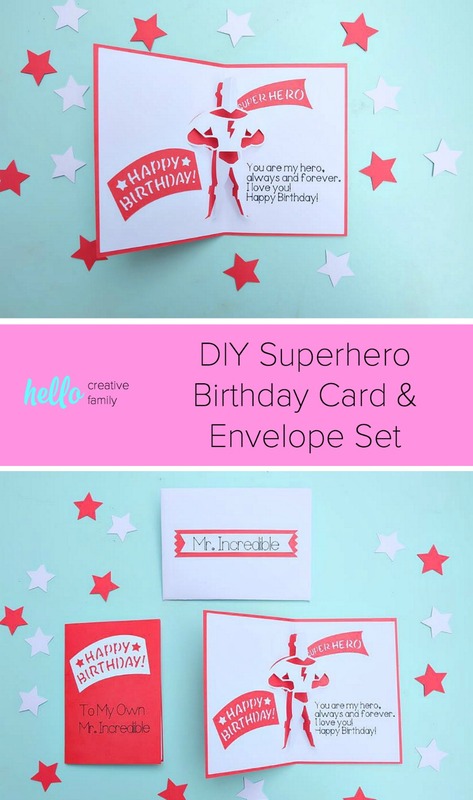 Say “Happy Birthday” to your favorite superhero with this DIY Superhero Birthday Card and Envelope Set. Made using your Cricut, this project is easy enough for those new to card making but packs a big impact. 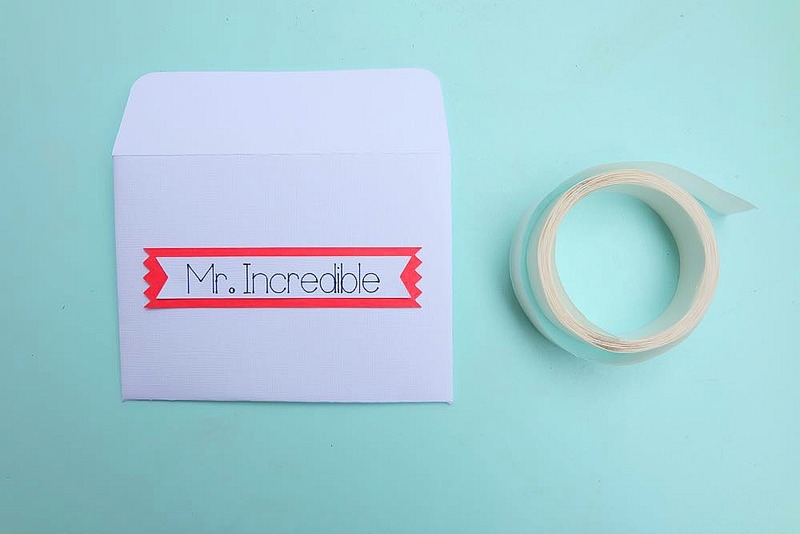 The perfect handmade element for a birthday gift for fans of Marvel, The Incredibles and DC Comics. Since my kids have been old enough to hold a crayon and put it to paper I’ve been having them make birthday cards for their friends. 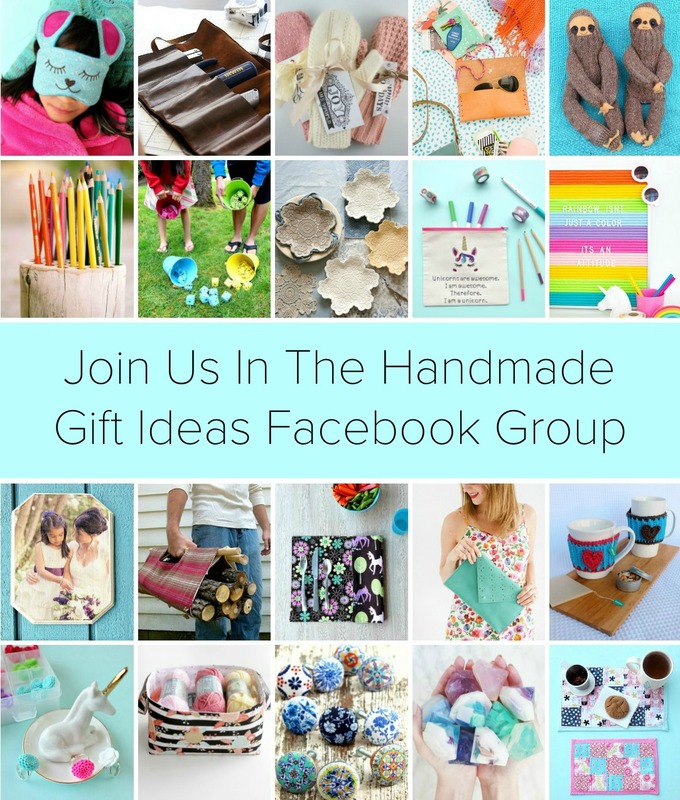 Let’s be honest, the majority of greeting cards end up in the recycling bin and if you do keep cards and put them in a scrapbook there is something extra special about a handmade card. I started having my kids make handmade cards because I preferred spending the extra money on the gift rather than the card but once they started making them I realized how special it was to see what my kids would create for the friends and family members. For a long time I would say to my kids “Make sure you put mommy and daddy’s name in the card too”, but I recently started thinking that if I’m having the kids take the time to make a card and put some thought into it, that I really should be too. Yesterday was my hubby’s birthday and I while I had the kids sit down to make a card, I made a card for him too. My card making skills are pretty basic. One day I’ll work my way up to cards that have 50 different colors of cardstock and layer upon layer of images, but for now I like to keep things pretty simple. 2 to 3 colors of cardstock is my maximum and I really love to create cards that take 30 minutes or less. The card that I’m sharing with you today fits all those bills. It’s a simple two toned card and envelope set. 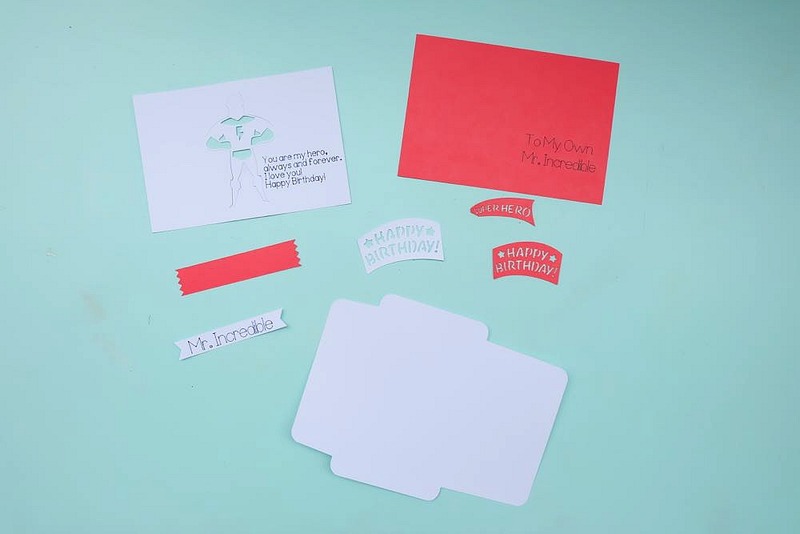 You’ll need 1 piece of white card stock that is 12X12 or (2 pieces of 8.5X11) and 1 piece of 8.5X11 red card stock. 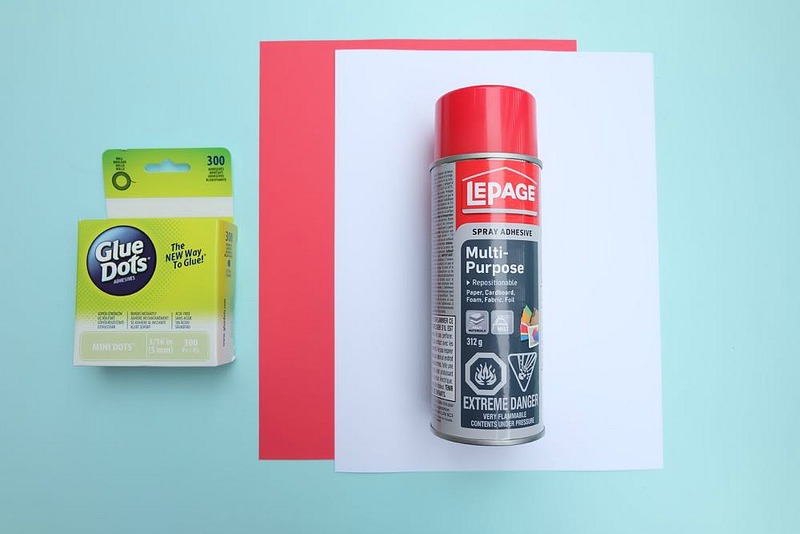 I highly suggest having the right tools for ever job and while you could use a glue stick for this project, I find card making to be so much easier when using spray adhesive and glue dots, so that’s what I’m going to recommend. My family sees every single superhero movie that hits the big screen, and LOVES the Incredibles. This card reminds me of Mr. Incredible. The interior of the card comes from the Cricut set- Close to My Heart- Artfully Sent, but I added words and banners to the front of the card, a greeting to the interior of the card and an envelope with banner. Feel free to change any of the words when you are making the card yourself. I just put text in to get you started. The Close To My Heart- Artfully Sent cartridge is amazing and a great way to get started with card making. They don’t appear in the Cricut Make It Now Cards section so there are no instructions for making them on the Cricut site but I’ve walked you through how to make it below and once you’ve made one, the rest of the cards in the set should be pretty simple to figure out. 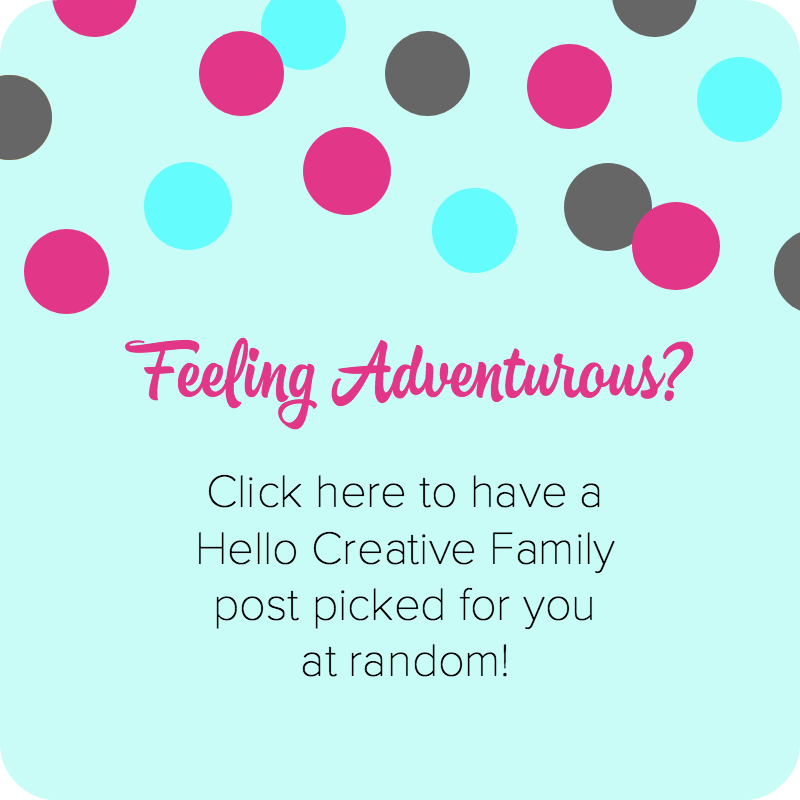 I hope that you love this project and that it inspires you to start making cards yourself! Happy card making! 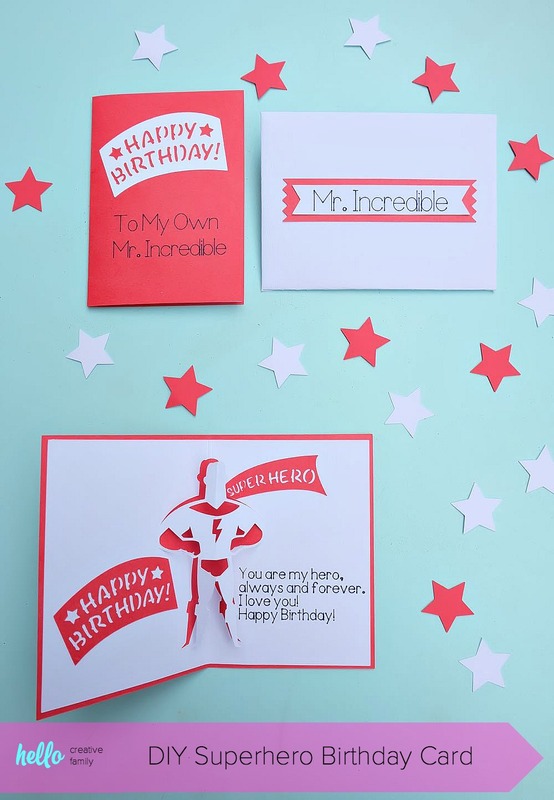 Read on for the cut file and instructions for how to make my DIY Superhero Birthday Card and Envelope Set. Step 1: Open my Mr. 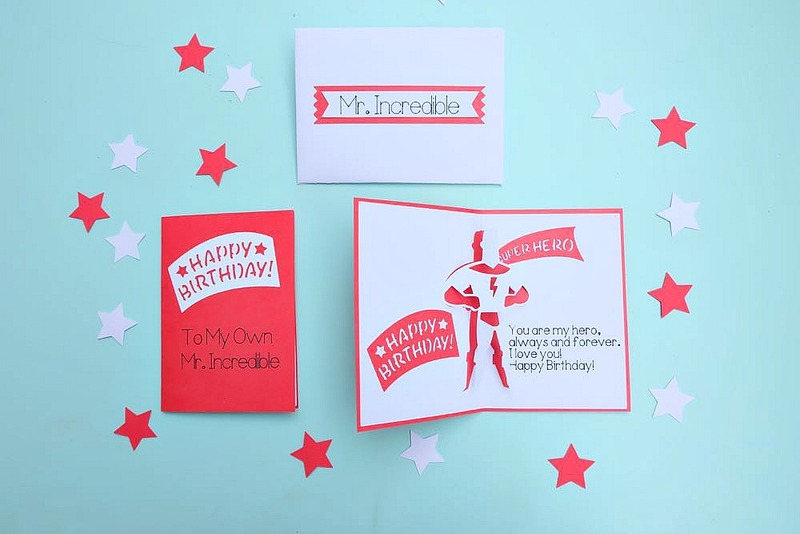 Incredible Birthday Card Cut Fileand click “Make It”. Step 2: Set your dial to “custom” if using a Cricut Explore and select Cardstock For Intricate Cuts as your material. Load your machine with the tools that you are prompted to load (scoring stylus then pen) and your paper on the cutting mat and start cutting, scoring and writing. Step 3: Weed your cut pieces from your cutting mat. I like to bend the cutting mat to remove the cut pieces of paper from the mat instead of pulling at the paper so that your paper doesn’t end up curled. The photo below shows all the pieces you should have cut out. 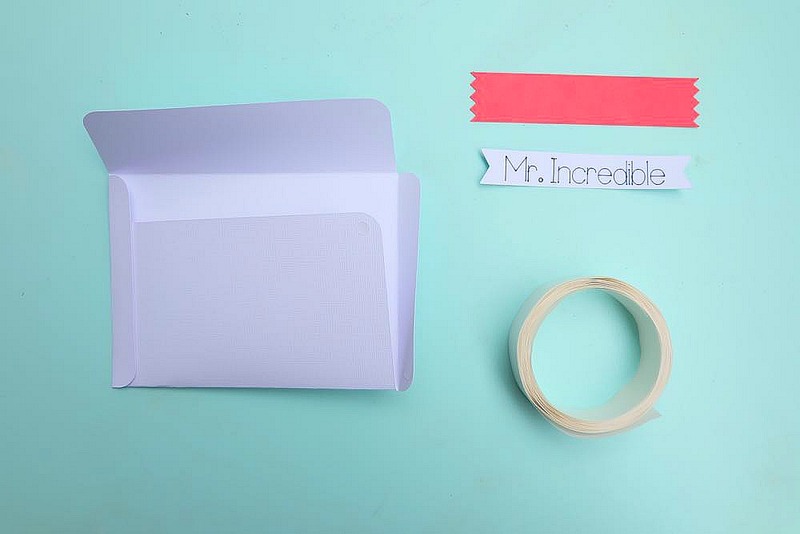 Step 4: Assemble your envelope. Fold envelope piece along all of the score lines and use glue dots to secure. 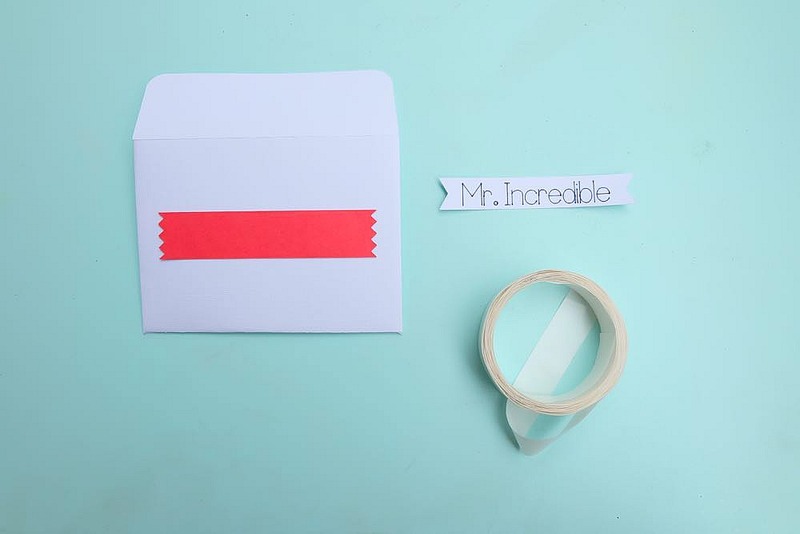 Put glue dots on the back of the red banner and attach to the front of the envelope. Put glue dots on the back of the Mr. Incredible white banner and attach to the top of the red banner. Your envelope is assembled. Step 5: Make the folds in your white card along the scoring lines, so that the superhero pops out. I find this easiest to do by folding the card in half along the scoring line so that the printed text is facing out. 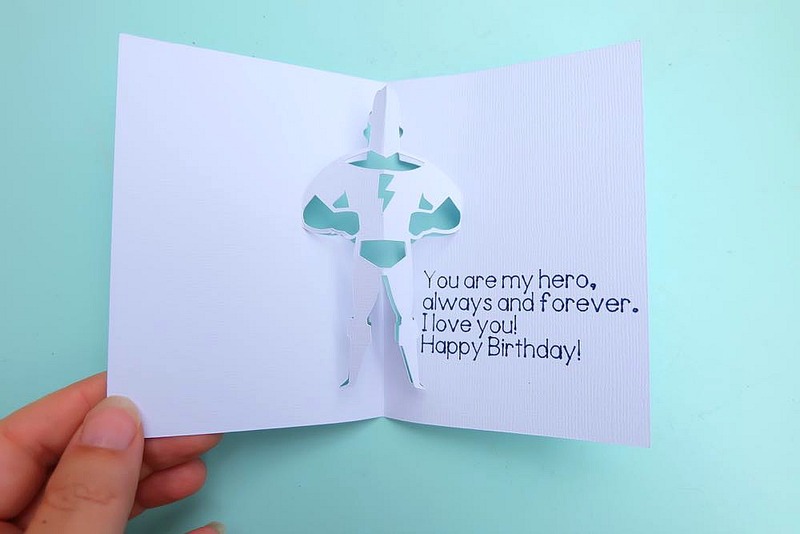 Fold along the score lines by the elbows of the superhero then fold the card so it’s folded the correct way with the text facing the inside of the card. 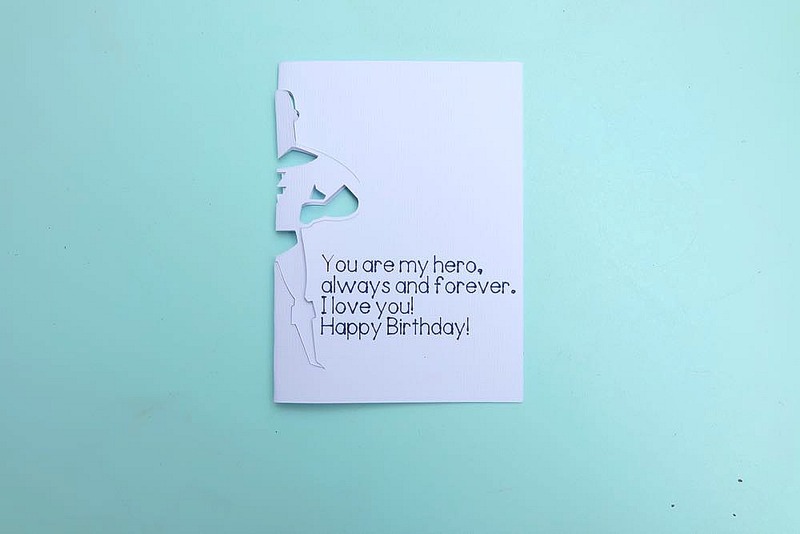 Your superhero should now pop out from the center of the card when you open it. 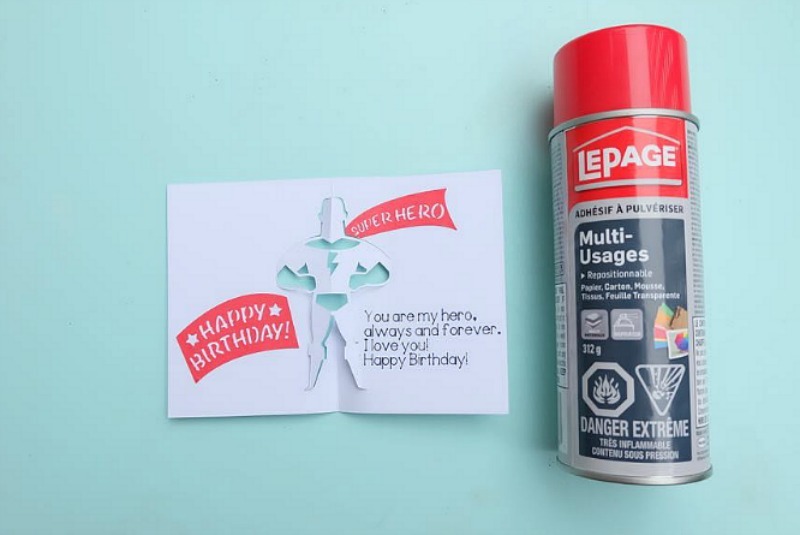 Using spray adhesive add the superhero cape and the Happy Birthday banner. Step 6: Assemble the outside of your card by folding the red piece of card stock so that the text is on the outside of the card. 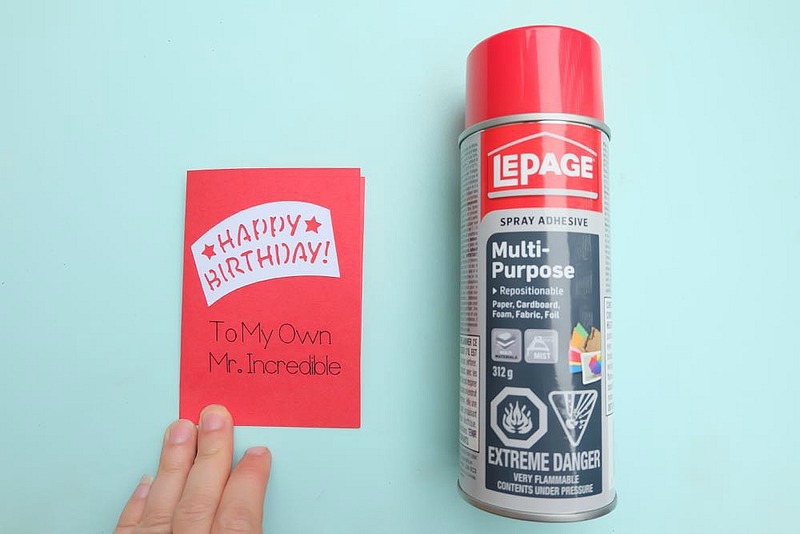 Use spray adhesive to attach the white happy birthday banner. Step 7: Apply spray adhesive to the back of the white card insert with the superhero, avoiding the pop out part with the superhero. Attach the white card insert into the red outside of the card. Press down all over smoothing out any bubbles and making sure to close the card to make sure everything is laying flat. I like to place a heavy book on top of the card to make sure that everything stays attached and dries properly. Voila! 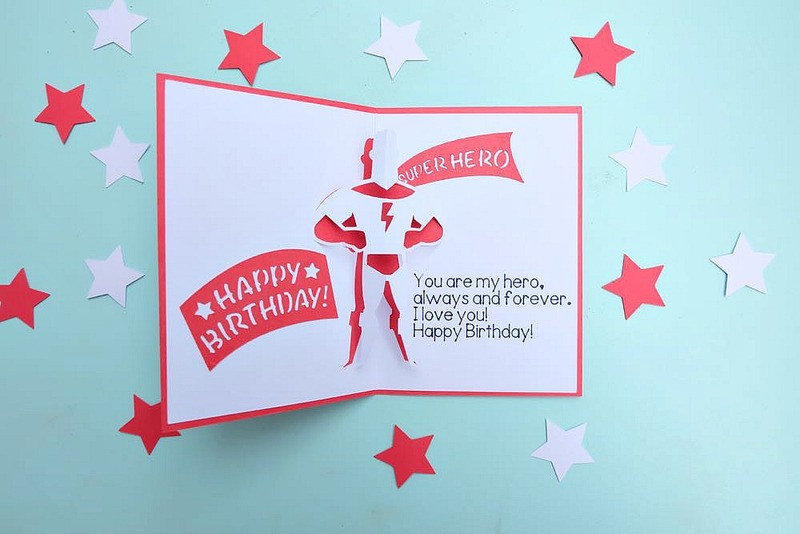 You have a fun and festive handmade card to give to your favorite superhero! 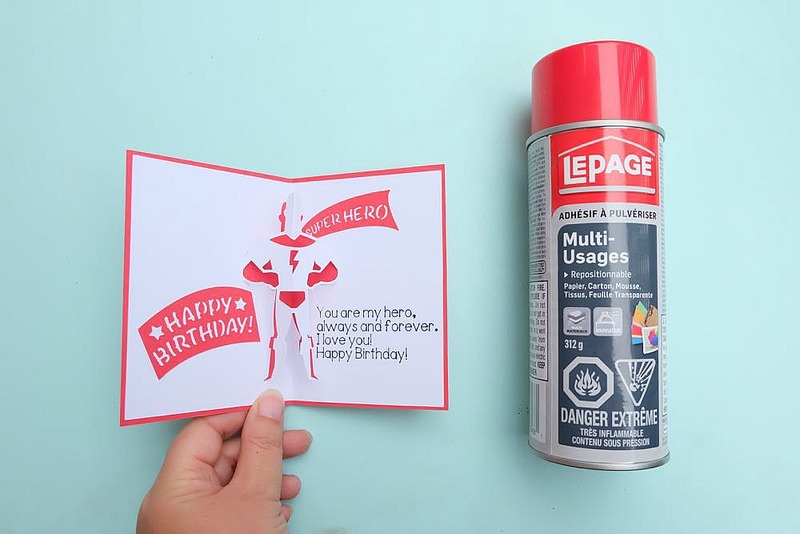 I hope you enjoyed our DIY Superhero Birthday Card Tutorial! Tell me… Do you ever make handmade cards? 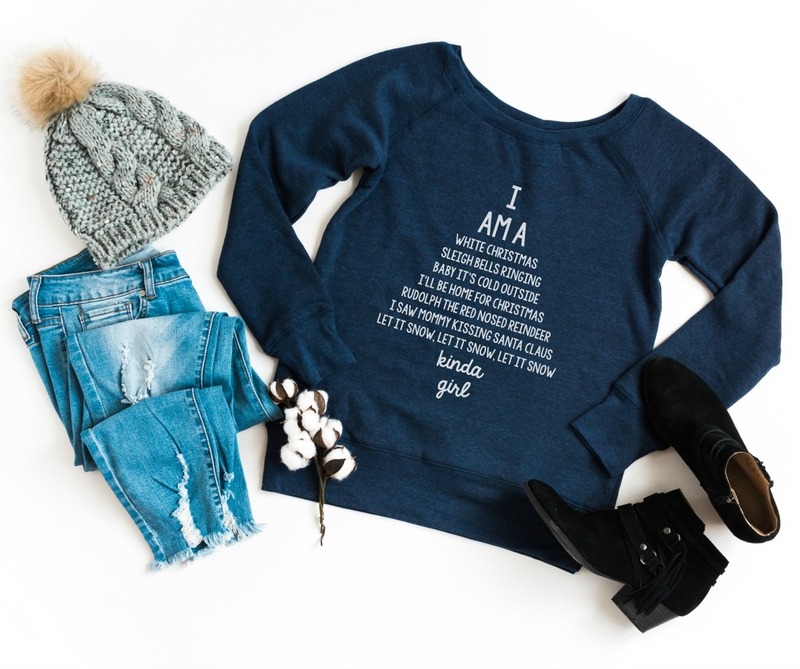 Do you own a Cricut? What kind of things do you make using it? 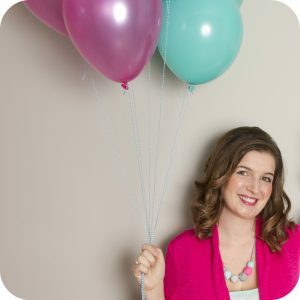 Want even more Cricut ideas? 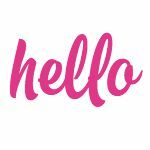 We’d love for you to check out our other Cricut projects! 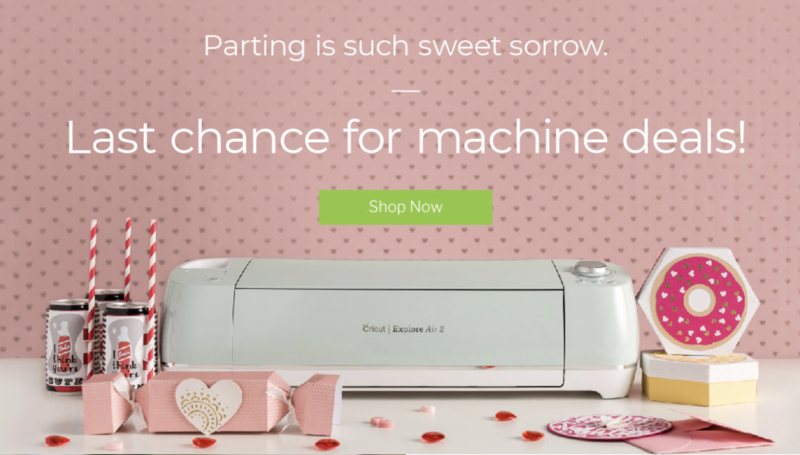 Find our Cricut category here or by clicking the photo below. « Easy DIY Planter Box + Garden Therapy Kids Gardening Kit + A Giveaway! That is such a cool pop-up!